The Invacare Quick-Change Crutch is a patented design features push-button height adjustment. Lightweight, anodized aluminum with solid one-piece frame. High-impact plastic armrests and contoured, padded nonrotating handgrips. Rubber tips reinforced with metal inserts for longer wear. Weight capacity: 350 lbs. 3-year limited warranty. Lightweight. Easy To Use. Good Value. Good for the price. I like that they are lightweight. Lightweight. Safe. Stores Easily. Supports Weight. Easy To Use. Well Constructed. Good Value. Long Distances. Outdoors. Indoors. Short Distances. Wet Weather. This product is exactly what is stated. They worked great for my 6 and 8 year old. They were the most reasonably priced that I could find and they arrived rather quickly. Very well made. Would purchase again if needed. Lightweight. Good Value. Well Constructed. Lightweight. Safe. Supports Weight. Easy To Use. Good Value. Well Constructed. Long Distances. Outdoors. Short Distances. Indoors. Wet Weather. I have used crutches every day for years. Great buy for the price but they rattle with use. Nice Product. Bought as a backup pair. Good purchase. What does it mean when they give price per unit? The crutches are working fine but there is a very unpleasant smell coming from the rubber. Is there any way to lessen the smell? I've been using them for about 3 weeks. Try washing your armpits at least once a week. 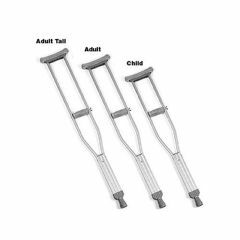 if i was to order a pair of crutches to day how long until i would receive them?